I’ve been having some really intense dreams of late. Night before last I was visited by a dark skinned warrior God, think Eli from The Book of Eli, strangely enough. That is a post in and of itself that I will get to at a later date. Last night in my dreams I had a visit from a Pooka. The Pooka is described by some as a goblin and by others as one of the Aos Si, the fairy folk, a nature spirit. Depending on who you talk to they can be benevolent or malicious. 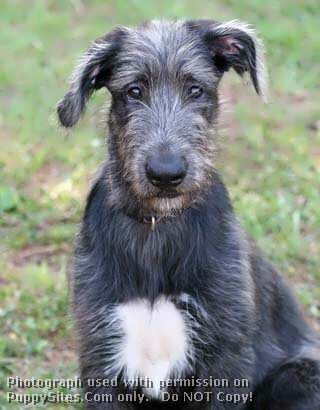 The one that visited me came in the form of a black Irish Wolfhound, a female I would say going by the size, with white feet and a white patch on the chest. Seemed a bit wary but most definitely friendly. She appeared at the feet of a man, a very tall man with red curly hair. Incidentally in my dream this man was technically a good friend I had in high school but with dreams things are never as they seem. She appeared from behind him, stood by his feet for a moment before scampering about in the grass and tree’s at the side of the road, (we were standing at a bus stop), looking back at me from time to time, tongue lolling and one of those sweet doggy smiles. I suppose there is a good chance she was trying to get me to come along. I will meditate again tonight and see if she returns. First Imbolc with the Little Man. Never payed much attention to the Holy Days besides Samhain and Yule. The little guy has brought more meaning to them. My celebrations were rather mundane. Started the Spring Cleaning. Set up the Homestead Planner for the month. Snuggled lots. Started a batch of fermented garlic. Made meatballs in tomato sauce, rice and creamed corn for dinner. The baking will have to wait until tomorrow. Also started a new journal. Will be written in, collaged and any other sort of artsyness I feel like. It was a good day.